The Les Paul Custom is the epitome of the classic Les Paul with its distinctive and trend-setting Ebony finish. And now Epiphone once again brings the Les Paul Custom back into the future with the new Les Paul Custom Classic PRO featuring ProBucker open-coil humbucker pickups with coil-splitting. The Les Paul Custom was first introduced in 1954 at the suggestion of Mr. Les Paul himself who wanted to prove to audiences that his solid body electric guitar was not a fad but a superb and challenging instrument. So, Les requested a Les Paul with a custom color finish in solid Ebony with gold hardware that would blend well with a tuxedo and really set-off a player on stage with style. The Les Paul Custom--or the “tuxedo” Les Paul, as it became known among fans--quickly became one of the most recognized guitars in the world. Les himself used his Les Paul Custom in concert for decades, on his weekly television show with wife Mary Ford, and on countless album covers, including Chester and Lester, his famous guitar duel with pal Chet Atkins. Vintage Les Paul Customs are out of this world expensive. But as usual, Epiphone has come to the rescue. With the new Les Paul Custom Classic PRO, everyone can now own a truly professional and affordable Les Paul with the unbeatable vintage sound of ProBucker humbuckers along with coil-splitting and all of the original Custom’s features including classic gold hardware, a fully bound body, neck and headstock, and pearloid inlays. Like all Epiphone instruments, the Epiphone Les Paul Custom Classic PRO comes with a Lifetime Limited Warranty and Gibson’s one-of-a-kind 24/7/365 Customer Service. Make your own “Les Paul” worthy history today with the Les Paul Custom Classic PRO. See your Authorized Epiphone Dealer for details. While all Les Pauls share common design features, the Les Paul Custom distinguished itself from the Les Paul Standard and Les Paul Goldtop with a solid mahogany body. The Les Paul Custom Classic PRO carries on that tradition but with the added twist of a maple veneer top which adds a subtle “bite” to the Les Paul Custom’s legendary tone. Just like Les’ personal Custom guitar, the new Les Paul Custom Classic PRO has a solid mahogany neck with a 24.75” scale that’s hand-fitted with a glued-in joint for optimum neck-to-body contact which allows the Les Paul Custom Classic PRO to resonate as one solid piece of wood. The fingerboard features pearloid trapezoid inlays and has a 12” radius, a 1.68” nut and 22 medium-jumbo frets, just like the original. 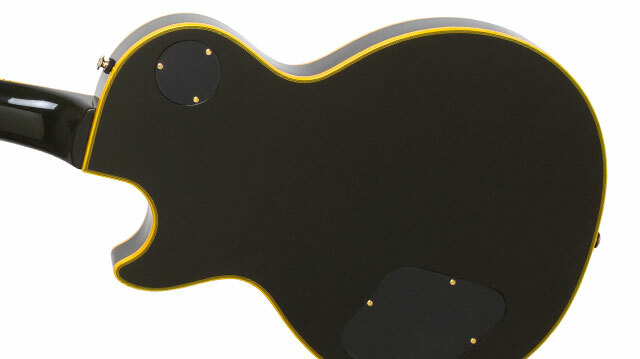 The black, 3-layer pickguard comes unattached and is include with the guitar. The Les Paul Custom Classic PRO also features the Custom’s famous 5-ply white and black binding on the top, headstock, and body back with an antiqued look and single-ply antiqued white binding on the neck. The Les Paul Custom Classic PRO is powered by Epiphone’s critically acclaimed ProBucker™ humbuckers, constructed with sand cast Alnico II magnets, high quality 4 conductor lead wire vacuum wax potted to eliminate microphonics, and 18% Nickel Silver unit bases and covers, the same alloy used by Gibson. The use of Nickel Silver reduces the occurrence of eddy currents due to low conductivity and provides a more transparent and crisp output. The size and shape of bobbins also has a great impact on tonal response. 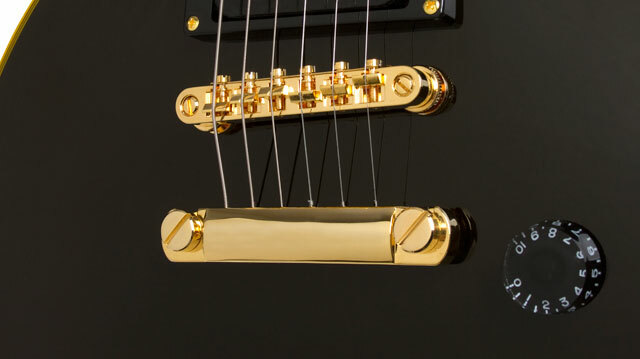 The bobbins used on the ProBucker pickups duplicate the size and shape of the gold standard in the industry, Gibson humbuckers. 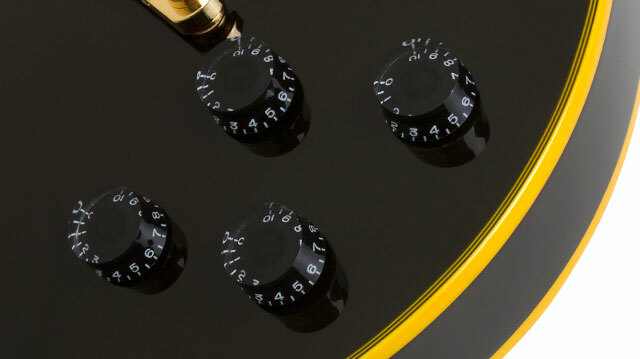 All volume and tone controls are vintage styled “Black Speed Knobs” that feature full-size 500K Ω potentiometers matched with Epiphone’s rugged, all-metal, 3-way toggle pickup selector switch for long-lasting performance. Epiphone’s reputation for great guitars extends to its unbeatable hardware and the Epiphone Les Paul Custom Classic PRO delivers with a standard-setting gold LockTone™ Tune-o-matic bridge and a gold Stopbar tailpiece. For superb tuning stability Epiphone introduces its gold Deluxe™ machine heads with a 14:1 tuning ratio. An optional hard case is available. A left-handed model is also available.